Lizard Point at the end of the Lizard Peninsula is Britain’s most southerly point at 49°57′ N for those sailors out there. It is approximately 10 miles from the nearest town of Helston and is well worth a visit, just to say you have stood on the most southerly point of mainland Britain. The scenery is spectacular all year around but especially in Autumn as many of the plants growing in the cliffs die back and the different colours look stunning. 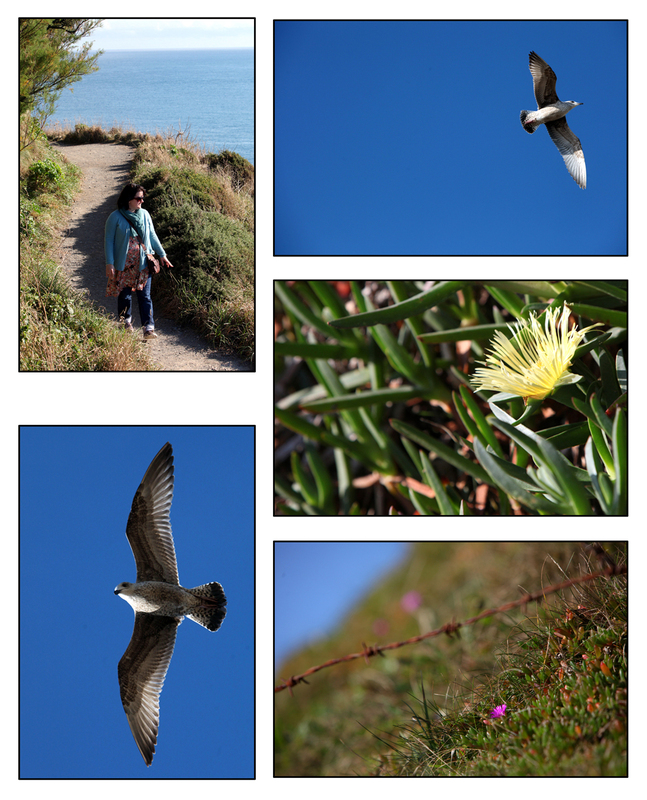 So last Sunday my parents, Becky and I headed off to the Lizard. 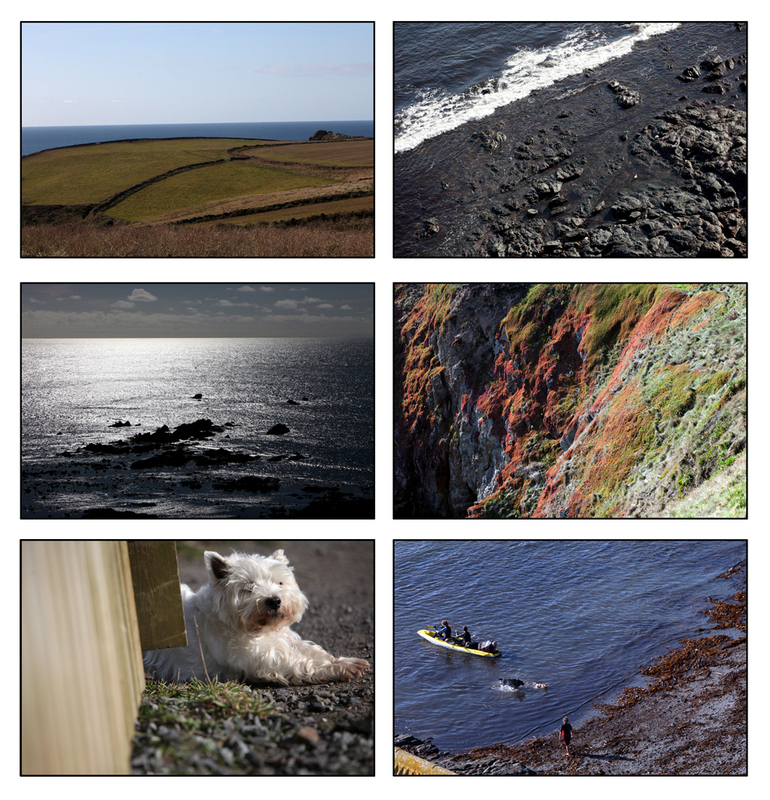 I’ve also loved visiting the Lizard and its various villages (which I will touch on in later posts) all my life so we had to pay it a visit on our whistle-stop tour of South and West Cornwall. The land mass of the Lizard is approx 14 miles square and is mainly made up of serpentine rock, a very attractive rock used for decorative purposes such as columns in stately homes, museums, as well as many smaller items some of which you can buy as souvenirs from the shops in the Lizard village. We parked up in the National Trust car park and walked the short walk down to the Point. You can take your chance and try to drive to the car park on the point where you can sit in your car and admire the view! However, this small car park does get incredibly busy, is accessed by a narrow road and you will often meet cars coming the other way. My advise for Sunday afternoons and high season is park in the NT car park. There are two ways down, one with steps which is slightly quicker or if you prefer a more leisurely gradient take the longer route, it must take all of 2 minutes more! Once you get to the point, you will see a gift shop, a cafe and a NT hut, all worthy of a look. The cafe in particular is a lovely place to stop and soak up the view, with its small terrace outside you can enjoy some lunch or just an ice cream, these lucky people in the picture bottom right kindly demonstrated sitting on the terrace and soaking up some rays. The picture bottom left shows the old lifeboat station built in 1914 with the original one being built on the site in 1859. In 1959 a new lifeboat station was built in Kilcobben Cove and now houses the new Tamar class lifeboat. To find out more about the Lizard RNLI and the amazing work these people do click here. 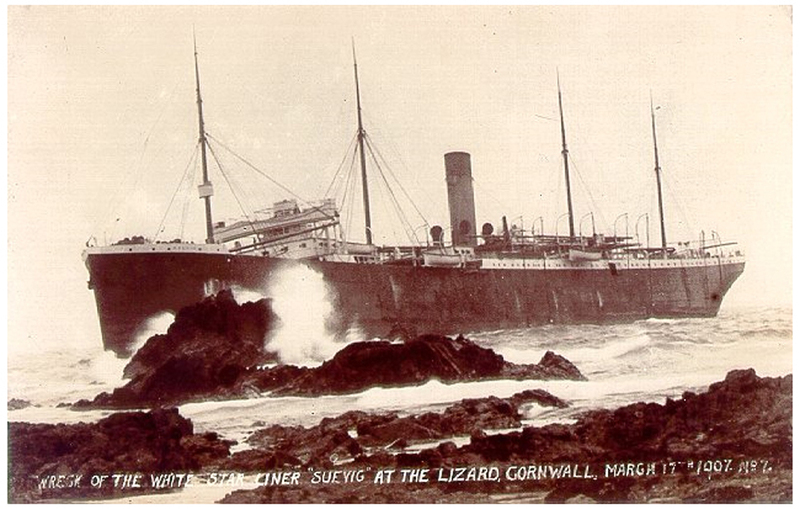 The largest rescue was in 1907 when a 12,000 tonne liner, the SS Suevic hit a reef near the Lizard Point. 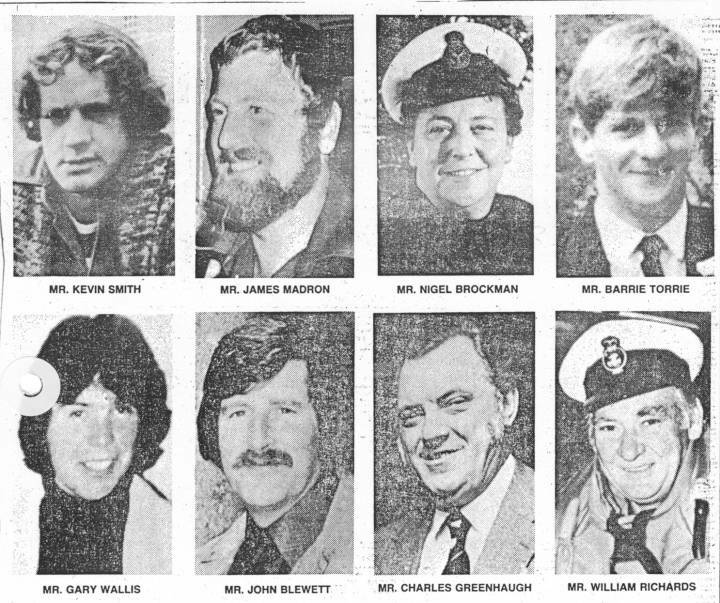 456 passengers including 70 babies were saved over a 16 hour period as RNLI crew from the Lizard and surrounding villages rowed out repeatedly to save every soul onboard. The Lizard is a haven for flora and fauna, from rare coastal plants that thrive on the south facing cliffs to various seabirds. Also you may be lucky to spot basking sharks off the point in the summer! 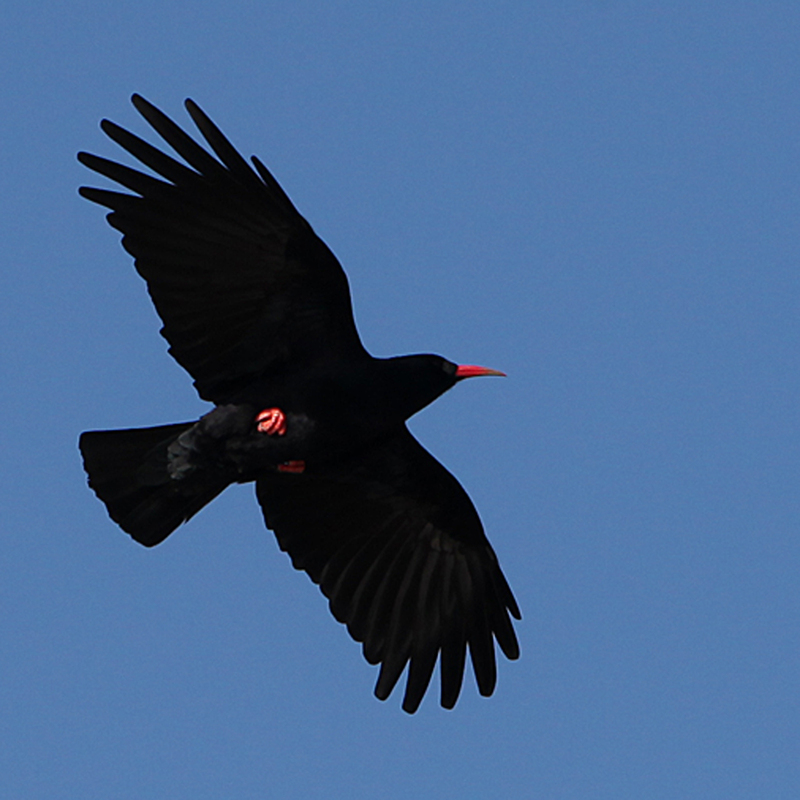 And finally, I have often heard rumours of sightings of the Cornish Chough over the Lizard Point. This was something I really wanted to see but didn’t want to build my hopes up. On walking down my Dad got chatting to a gent he had known from years ago, he and his wife both had binoculars around their necks and looked like keen bird watching enthusiasts. We stood on the west side of the point (by the cafe) looking at the cliffs in the hope of seeing a Chough. With plenty of Jackdaws flying about how would I distinguish a Chough from a Jackdaw? Then, with his binoculars raised to his eyes this keen birder shouted ‘there’s one’, with the distinctive loud ringing call, its fanned wing tips and its more acrobatic maneuvers than the Jackdaw how I was to confuse the two? O, and its bright red beak and feet where a bit of a giveaway too! The Last Chough vanished from our cliffs in 1971. 30 years later the Chough naturally returned to Cornwall and now with the help of the RSPB and its volunteers who protect the nests from egg collectors The Cornish Chough is back and breeding in Cornwall! To find out more about the Cornish Chough Project click here. 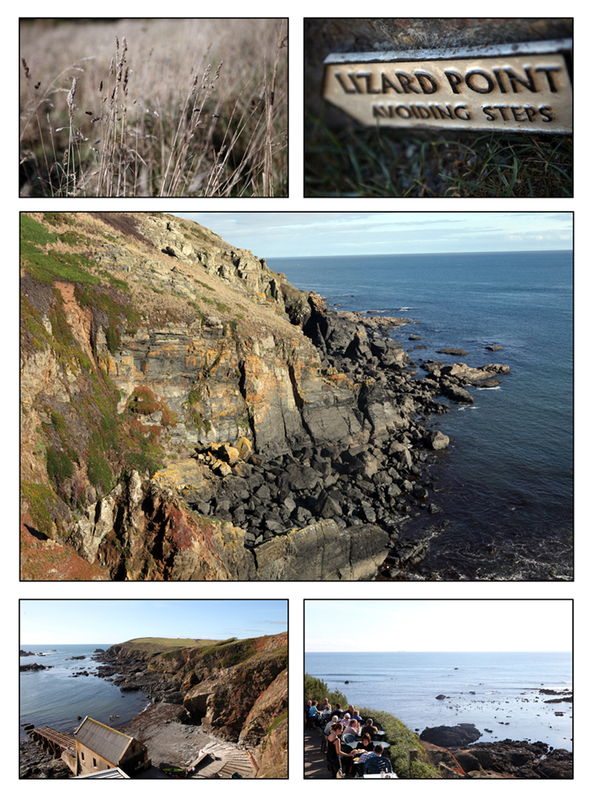 Walkers on cliff tops at The Lizard Point, one spots the Choughs!